Group of young people in casual clothes sitting around table, discussing new project and asking opinion of bearded man. Group of colleagues in casual clothes sitting around table, discussing project and choosing new ideas while using tablet. Group of colleagues in casual clothes discussing ideas of bearded man, pointing at some items and making notes in notebooks. Group of colleagues in casual clothes standing together, discussing new project and using tablet while searching for new ideas. Group of colleagues in casual clothes standing near table in office, discussing project and making notes. Group of young people in casual clothes, smiling and discussing new project while using tablet. 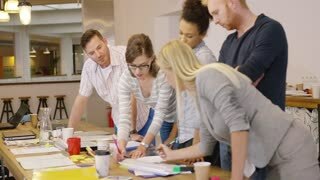 Group of people in casual clothes sitting in office and listening to bearded man carefully while discussing important project. Group of people in casual clothes sitting around table, discussing new project and searching for new ideas by using tablet. Group of colleagues in casual clothes sitting in office, discussing important project and making notes in notebooks. Group of colleagues in casual clothes looking at bearded man ideas on his laptop and approving really good one. Group of young people in casual clothes sitting in office and using laptop while discussing important project. Group of colleagues in casual clothes using laptop, discussing important project and listening to ideas of bearded man.